Greens fees, with riding cart: $39/$29 seniors, women and juniors, Monday - Thursday; Friday, $23 to $41; Weekends and holidays, $27 to 49; twilight rates after 1 p.m. every day. Golf package prices: Monday - Thursday), $84 per person (double occupancy); Friday - Sunday, $94 per person (double occupancy). 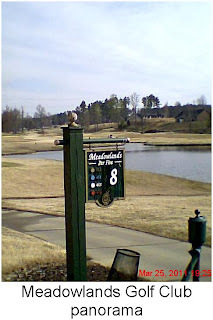 My stay in the Winston-Salem area of North Carolina ended Friday on a decidedly upbeat note with 18 holes at Meadowlands Golf Club. This first-rate track was designed by renowned touring pro and World Golf Hall of Fame member Hale Irwin. A professional acquaintance who has played Meadowlands sang its praises when I shared with him the list of courses I'd visit during three days in Winston-Salem. Let me now join in that chorus. Meadowlands is beautiful, challenging and completely playable at yardages from just over 4,800 yards from the forward tees to 6,868 yards from the tips. The greens are smooth and quick for this time of the year, when much of the grass in the rough and fairways in these parts is just beginning its awakening from winter dormancy. Change of elevation is another feature of Meadowlands. There is just the right amount of water in play. That's especially true on No. 10, a tough par-4 that plays anywhere from 282 yards to 440 yards. If you use the gold or blue tees, there is a forced carry over water on the tee shot. Even from the forward tees, water is a factor with a pond on the right side that stretches almost the full length of the hole. Throw in a fairway with a pronounced left-to-right tilt, and we're talking about a knee-knocker of a tee shot. 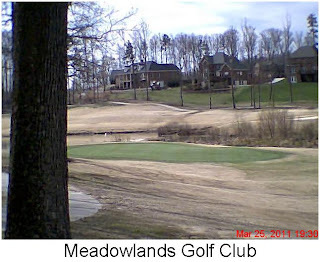 Meadowlands features a spacious practice tee-driving range and putting green, too. I want to end the chronicling of my time in Winston-Salem with a shout out to the Village Inn Golf & Conference Center in Clemmons, where I spent four restful nights. The Village Inn offers an ultra-convenient location at Exit 184 of Interstate 40, clean rooms, friendly staff and a golf-centric business plan spearheaded by golf coordinator and business manager Ashley Seamon. Daily golf-lodging packages are $84 (Monday - Thursday) and $94 (Friday-Sunday). Visit the two websites noted above to checks out the 12 courses participating in Village Inn packages. You'll also want to get up to speed on the some of the nice extras included in the packages, including a folder with breakfast and beverage coupons as well as driving directions to every course. There are restaurants galore within a 10-minute drive of the Village Inn. All of the 145 guest rooms are soon to get a complete makeover, too. Ashley offers still more details about the hotel and its commitment to affordable golf packages in a video interview posted on www.news-herald.com. If this blog whets your appetite for a Village Inn golf vacation and you make the trip there soon, don't be surprised if you run into fellow Northeast Ohio golf "snowbirds'' during your stay. 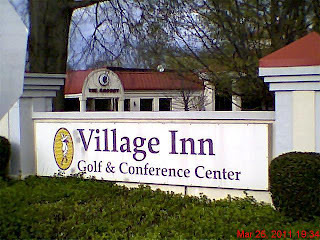 As busy as I kept myself while based at the Village Inn, I feel as if I merely scratched the surface and need to play all of the affordable courses in the Winston-Salem area I didn't have the time to visit this time. Sounds like a compelling rationale for a return trip.